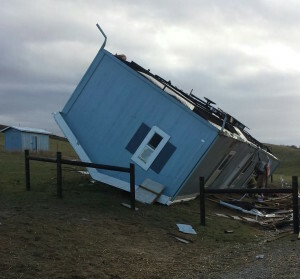 High winds have uprooted and turned upside down a mobile home in rural Paso Robles, according to Cal Fire. The storm sweeping through San Luis Obispo County has also caused thousands of residents to lose power. More than 3,800 customers lost power in Pismo Beach Wednesday morning. Several thousand customers also lost power in San Luis Obispo. More than 3,300 customers in San Luis Obispo remained without power around 8 a.m. There are also smaller outages in Atascadero, Avila Beach, Cayucos, Los Osos, Oceano and Paso Robles. What do a redneck divorce and a tornado have in common? Somebody is going to lose a trailor. I am really very sorry someone lost their home. That probably costs like $200,000 central coast dollars. I am glad the person inside was ok. They figured tornado. I live in Paso and right before this would have happened this morning a strong cell of activity went by closer to town where I am. They aren’t in Kansas anymore, Toto. I know that there is always a question about liability but truly who permitted and approved the final installation? This is a new enough home to have been required the seismic stuff but I’ve never heard of a wind load consideration for a final? Very sorry to read the bad news and I hope there is a doable recourse for their remedy. Wind, seismic, same thing. Clearly it didn’t have tiedowns. Wind loads and seismic loads are VERY different forces. As of 5 yrs ago (don’t know about now) seismic consideration (typically, wide footings and bolted piers and sometime diagonally bracing) is required to resist side loads and separation of home from piers. Wind and hurricane (up lift) consideration is not required. Typically when you see anchoring to the ground (to prevent up lift) it is the results of insurance or lending requirements. I love how people are throwing around what they think is done or what needs to be done without understanding. To secure a mobile home for lift you would have to secure to ground. Most likely only way to achieve would be to put at least one caisson on each corner of unit. Now how deep? That is another question. REALLY??? There isn’t a mobile home around that they tie down in this state. Love people pulling their imaginary facts out of the air. Heck by that reasoning then why don’t they use hurricane tie straps on roof trusses to exterior walls in new homes? I love how people here hate to hear the truth.